Thanksgiving is the perfect time to visit Hawaii: the weather is beautiful, and a roster of fun seasonal events are sure to bring holiday cheer. 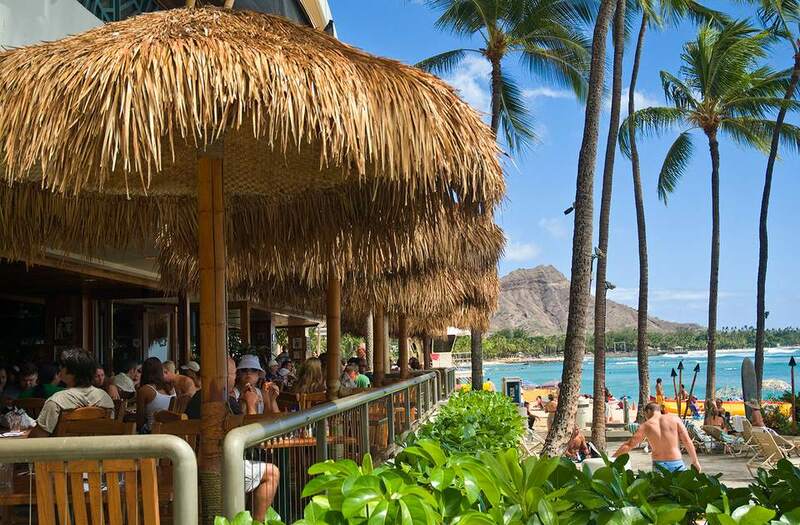 Although in Hawaii, locals celebrate with the traditional Thanksgiving dinner and tree-lighting ceremony leading up to the holidays, there are also plenty of beach-themed activities that go hand-in-hand with Hawaii's laid-back island attitude. Additionally, you'll find historic events such as the Waikiki Holiday Parade, which commemorates Pearl Harbor by honoring survivors and veterans in memory of the attacks. If you're planning on a Hawaiian holiday, make sure to book far in advance as resorts, flights, and events tend to sell out quickly. Stop by Santa's Beach House at the Ward Entertainment Center, Box Office Level (near Ward 16 Theatres) throughout the holiday season for photos with Santa and a chance to share your wish list. Santa photo packages will be available starting at $22. The event is held from November 19 to December 24 in Honolulu's Ward Village residential and commercial district. Thanksgiving dinner will feature a sumptuous buffet with a variety of selections including a chef carving station with slow-roasted prime rib, country ham, and holiday favorites like roasted butternut squash bisque and soy-braised boneless beef short ribs. The cost is $75 for adults and $35 for children (no discounts for Thanksgiving dinner), and reservations are available for seating between 4 p.m. and 9 p.m. To make reservations, call Sheraton Waikiki Dining Reservations at (808) 921-4600. The Ward Village Ice Rink will offer a special open-air skating experience for a limited time only from late November to early January at the Ward Village Information Center Courtyard (former IBM Building). The Ward Village Ice Rink will be open daily, with tickets (including skate rentals) available at the rink at $15 per person for a one-and-a-half hour skate time. Kope Coffee Co. will offer hand-crafted beverages and refreshments, including hot cocoa, espresso drinks, and more. Chef Shaymus Alwin presents a very special dinner on Thanksgiving evening at the Azure Restaurant. First seating is 5:30 p.m. and 6:00 p.m. Second seating is 7:45 p.m and 8:15 p.m., and the cost is $125 per person or $151 with wine pairings (not including tax and gratuity). The menu will feature Kona lobster bisque, roasted beet salad, truffle-roasted turkey, rosemary citrus-glazed pork chop, and salt-baked fish and clams. More than 400 island vendors offer their island and holiday crafts at the Neal Blaisdell Exhibition Hall between November 23-25, 2018. This is one of Hawaii's largest and best attended craft fairs with more than 30,000 people expected to attend. Some of the crafts include hand-blown glass, clay pottery, feather accessories, Polynesian carved pendants, and more. Thanksgiving dinner buffet begins at the Beachhouse on Thursday, November 22 at 3 p.m. and will continue through 8 p.m. The cost is $85 per person and $40 for children under the age of 12 (prices do not include tax and gratuity). Reservations can be made by calling Dining Reservations at (808) 921-4600. The extraordinary dinner spread is created by Beachhouse Chef David Lukela and Moana Sous Chef Jason Watanabe. For dinner, there will be a carving station (with prime rib, roast turkey, and a whole suckling pig) as well as main courses including steamed Snow Crab, Kiawe smoked ham, Kona lobster pasta with truffle cheese, and chicken and seafood paella. The lighting of the Christmas tree is a tradition that kicks off the holiday season. The event will start at 6 p.m. on November 30 at the Outrigger Reef Waikiki Beach Resort. It will be preceded at 5:00 p.m. by a Keiki Hula Show. Admission is free. The Waikiki Holiday Parade commemorates Pearl Harbor by honoring survivors and veterans in memory of the attacks. It is expected to have 4,000 marchers, 40 vehicles, and 36 bands including more than 30 bands from the mainland. It will start at 7:00 p.m. at Saratoga Rd/Kalakaua Avenue to Kalakaua Avenue, to Monsarrat Avenue., to end at Queen Kapiolani Park at around 9:00 p.m. In 2018, it will be held on Friday, November 23.